Sixty years ago, on November 28, 1950, the Savannah River Plant was announced by the United States Atomic Energy Commission (AEC) as a new facility to be built and operated by the E.I. Du Pont de Nemours Company. 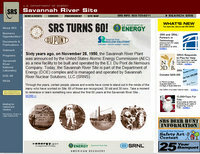 Today, the Savannah River Site (SRS) is part of the Department of Energy (DOE) complex and is managed and operated by Savannah River Nuclear Solutions, LLC (SRNS). SRS’s mission is to safely and efficiently operate SRS to protect the public health and the environment while supporting the nation’s nuclear deterrent and the transformation of the Site for future use.